This is a partial list of the public transportation that was available before the railroads came to our desert. Applewhite’s Stage: A 3-bench buggy that carried men from the mines in the Calico area into town to take care of business and to stay at Applewhite’s Lodging House. Arizona Overland Mail: From 1866 until 1868 the mail was carried over the Mojave Road between Camp Drum and Prescott, Arizona, by drivers William N. Ballard and Frank Clugage. It began as a weekly delivery in a wagon just big enough for the driver and one passenger and soon advanced to twice-weekly deliveries in a Concord stage. After two years James W. Parker, the contractor, changed the route to the La Paz Road because of Indian troubles and the loss of over 100 head of stock. Barnwell to Death Valley Route: A route from Barnwell to Manse, Nevada, that for many years had a daily stage using it. The stage was abandoned with the completion of the Salt Lake Railroad, but the road was still used by travelers and miners to get supplies at Barnwell or Ivanpah. From Ivanpah the road ran north to State Line Pass and Mesquite Lake and on to Sandy, Nevada. 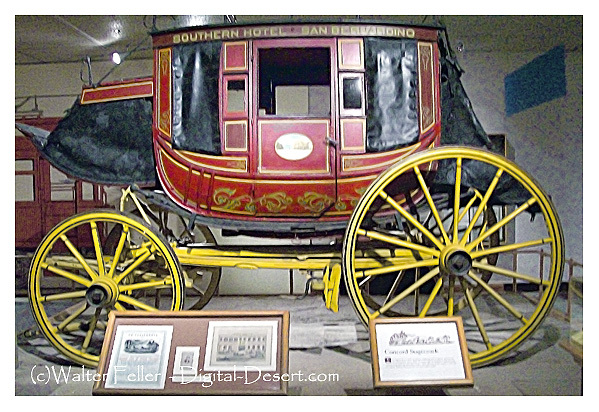 Barnwell to Searchlight Stage Line: A stage coach that ran between Barnwell and Searchlight until 1906 when the Barnwell & Searchlight Railroad began operations. Black Canyon Stage Station: A stage coach stop in Black Canyon for the Panamint Transportation Company. Black Canyon Well: A hand-dug well and remains of a stone structure on the road through Black Canyon that first appeared on a map in 1915, but probably dates from about 1870 when this was a favorite overnight spot for both stagecoaches and freight wagons. There was a windmill here but it has disappeared. Also known as Dove Springs and Pigeon Springs. Brooklyn Well: A well in the Dale area that was a stage stop for the Dale to Amboy Stage Line in 1903. Butterfield Overland Stage Company: A stage line owned by John Butterfield who had a government contract to carry mail twice weekly from Tipton, Missouri, through Fort Yuma to Los Angeles and on to San Francisco from 1858 to 1860. The stage line came through the Mojave Desert on the Ox Bow Route, which was the name given to that part of the route that ran from Fort Smith, Arkansas, to San Francisco. We have found mention of a Butterfield stage station in the Oro Grande area, but all we have been able to learn about it is that the building was torn down in the early 1900s. Calico Stage Line (1): Between 1885 and 1887 Robert H. Greer and Woodson Barrett operated a stage line, using a Concord Coach pulled by a team of six horses, between Daggett and Calico. Calico Stage Line (2): In about 1885 this stage line was “restocked with relays of fine horses and a new light running, easy riding Concord Coach,” according to the Calico Print. It made two trips daily between the post office in Calico and the Railroad Hotel in Daggett. The line was owned by William Curry. California Southern Stage Line: A stage line that operated between Calico and Barstow and San Bernardino. Cottonwood Stage Station: A stage station on the Mojave River about 5 miles north of Helendale. On 18 May 1875, Cleovaro Chavez and about 15 of his gang rode in from the west and raided this station. Chavez was Tiburcio Vasquez’ right-hand man; Vasquez wasn’t there because he had been hanged in San Quentin on 19 March earlier that year. Crackerjack Auto Transit Company: An auto stage transportation company that had daily runs from Silver Lake to Crackerjack in 1907. One-way fare was $15, round trip was $25. 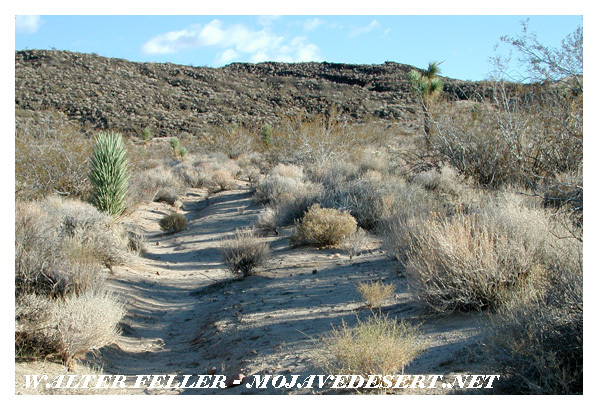 Daggett to Crackerjack Auto Stage: This first successful auto-stage to operate on the desert was established in about 1906. It was a touring car than ran from Daggett to Crackerjack for $25 per passenger. Daggett & Skidoo Stage Line: A stage line that came through Black Canyon. This is all we have found on it so far. Dale to Amboy Stage Line: A stage line from Dale to Amboy in about 1903. The fare was $5.00 which included lunch. The line was discontinued in 1916. Also known as the Buckboard Stage. Domingo Stage & Freight: A stage line and freight pack train that was owned and operated by Juan Domingo in about 1887. The stage ran from Providence to Fenner three times a week and the pack train hauled mostly ore from the mines to the mills. Goldstone-Los Angeles Auto Stage: An automobile stage line that ran from Los Angeles to Goldstone twice a week. The trip took eight hours and the rate was $10 for a round trip. Harrison’s Calico Express Line: A stage line owned by Aaron Harrison in 1882 that ran from San Bernardino to Calico. Each Monday and Thursday the stage left San Bernardino at 7 o’clock for the trip, which took a day and a half each way. Huntington Stage: This stage line, operated by Heber Huntington, was the first public transportation between San Bernardino and Calico and carried passengers and mail. At first the twice-weekly run used a cross between a surrey and a spring wage, but as business picked up Huntington purchased an old Concord stage. After the railroad was completed the route was shortened to run from Daggett to Calico. Livingtone & Cahill Stage Line: A stage line that operated between Barstow and Daggett and Calico carrying passengers and freight to and from the railroads. We don’t know who Mr. Livingstone was, but David Cahill of the father of “Wash” Cahill and had been a driver on the stagecoach between Barstow and San Bernardino. Mecham’s Panamint Stage: A stage line from San Bernardino to Panamint that was owned by Lafayette Mecham and was running in 1874. One-way passenger fare was $30. Nipton & Searchlight Stage Line: A stage line that carried passengers and freight from Searchlight to the railroad at Nipton in about 1910. Orange Blossom Mining & Milling Company Stage Line: A stage line owned by the Orange Blossom Mining & Milling Company that ran between Bagdad and the Orange Blossom mines and camp in 1908. Perew Auto Stage: An auto stage line that ran from Manvel to Searchlight in 1905 and was owned and operated by Bob Perew. It was initially a 16 Hp car pulling a two-wheeled trailer. The trip took two hours. Pioneer Stage: A stage line in the 1890s that ran three times a week charging passengers $2 to carry them 5 miles from the Nevada Southern Railway end-of-track at Manvel into Vanderbilt. From the Mojave Desert Dictionary, Edition 2, available at the Mojave River Valley Museum.